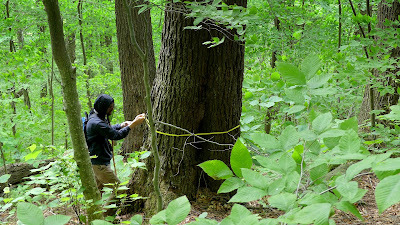 On the second day of this wet June, botanist and fellow old-growth forest trekker Jared Lockwood and I made a foray into the Monroe State Forest of Massachusetts. Our goal was to locate and film the old hemlock tree that is the current champion hemlock of New England. I first saw this tree in August of 2014, with old-growth-forest guru Bob Leverett leading the way to it. 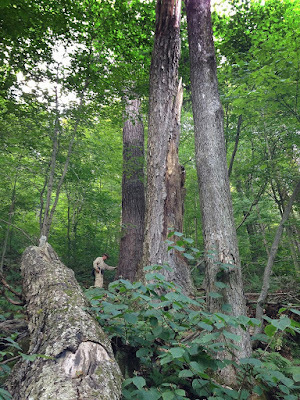 He and his son Rob discovered the tree about 29 years ago while intensively exploring the region for big, old trees. This day was a beauty- cool temperatures, energizing breezes, newly leafed-out forest. 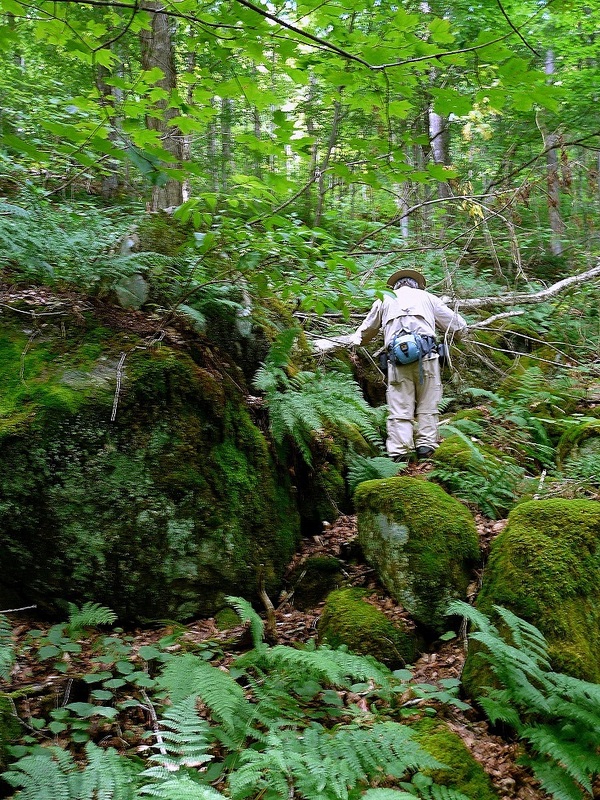 As we entered the deeply shaded forest, I happily remarked "this is great, no black flies!". "Yeah", Jared agreed. What a relief; this will be a good day. 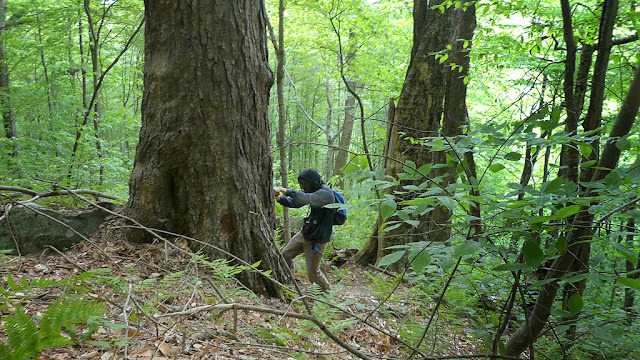 This champion hemlock is not a tree one gets to without difficulty (which is likely the reason it still exists). Up on a treacherous mountainside strewn with ancient boulders clad in deep green mosses and ferns, there is a remnant old growth forest. In summer months, when all is verdant, it's a ruggedly beautiful place to be, with a somewhat tropical ambience. Mosses. Ferns. Grand old trees arching over the slope. Hobblebush. Wildflowers. A rushing river at the base. Oh- gee, I almost forgot... black flies. You know: the direct descendants of Beelzebub. Ya, those. What a happy discovery. But at least there were some pockets of air where there were no black flies; those spaces were occupied by mosquitoes. There are two main differences between mosquitoes and black flies: mosquito "bite" wounds don't last for weeks; and, well, that's really the only important difference. They both want your blood, and not much diverts them from their frantic mission. Why is it that evolution produced mosquitoes who employ a hypodermic-like proboscis to efficiently tap into our blood supply, but it came up with black flies who have to chew their way in? Ok, back to the hike. 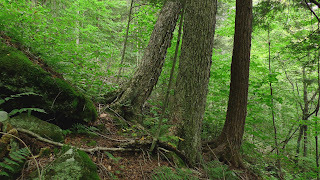 I couldn't remember just where the old hemlock stood in this ancient forest. Heavy foliage cover precluded the possibility of spotting it from any distance, so we had to bushwhack our way and hope to come upon it. If Bob had been with us, he could have taken us right to it. But he wasn't available this day. That meant Jared and I had to traverse the mountainside, up, down, and across the moss-slick boulder fields in search of it. 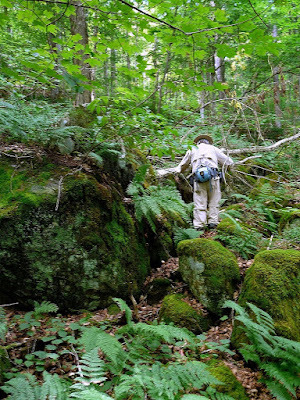 You don't just hike right through the boulders... they're nestled closely to each other, the small gaps between them concealed by fallen leaves, ferns, shrubby hobblebush, and more. What may look like solid ground among the rocks may be no more than a layer of fallen leaves suspended above a deep hole or crevice; plant your foot solidly on that, and you're going down, with a good possibility of snapping a leg or ankle bone, or engaging in the sport of rock-kissing. Frequently, large fallen trees complicate attempts to make progress. There is no cell phone service here. You won't see another human happening along. "Slow" is the operative word in this environment. And slow is what we were. Contrary to what one might imagine, the original eastern forests were not just a sterile collection of huge old trees. Large and small natural disturbance events (storms, winds, snow loads, fires, etc) were always damaging or taking trees down. Those openings in the forest canopy allowed sunlight to penetrate, and new trees quickly sprang up. 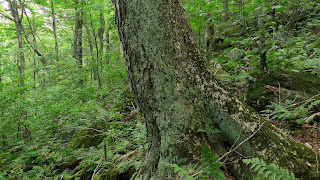 So, the eastern forests were a patchwork of all tree ages, from seedlings to the oldest monarchs. 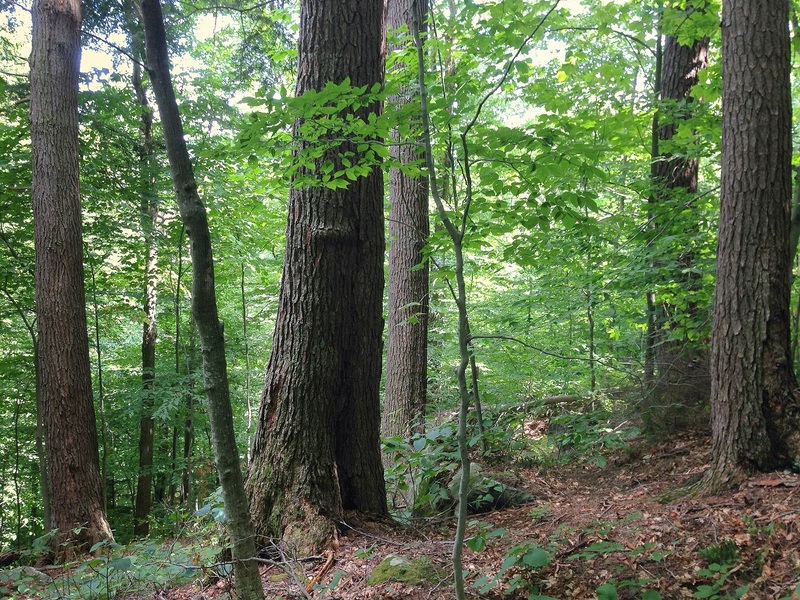 Some species, hemlock for example, are able to tolerate the shade of a closed canopy for many decades, poking along in the understory at a snail's pace of growth. When a disturbance provides them with more sunlight, they're then "released" from suppression, and grow much more quickly. This can be seen in the pattern of their annual rings... extremely narrow, tightly packed rings during the suppressed periods, wider rings at release (other factors can cause similar patterns too). Moreover, a diversity of ground-level plants flourished in the light as well, painting a lush, green world. 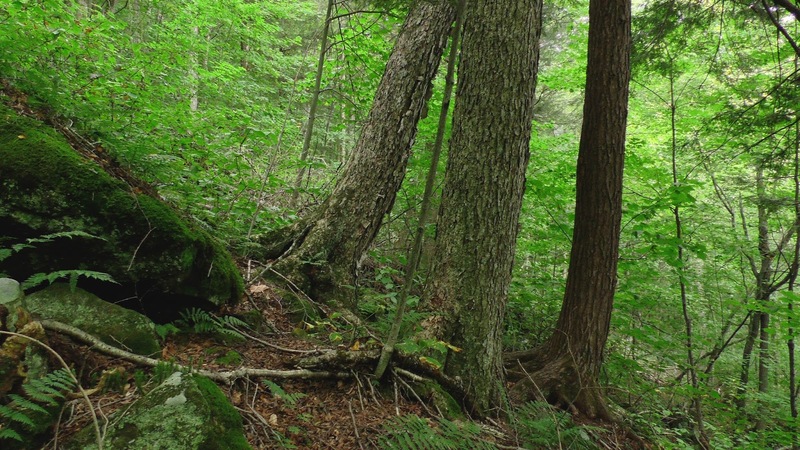 Over millennia, the forest floor accumulated organic material into a spongy, moist, nutritious duff layer, just perfect for plant establishment and growth. This important top layer of the soil is lost when a forest is cleared, along with many of its cadre of herbaceous plants, microbes, invertebrates, and fungal constituents. Jared and I trudged on and on, finally reaching a point where I knew we had gone beyond the champ hemlock's location. By now I was weary, and was on the doorstep of my tolerance limit of itchy bites. Slog on some more repellent (although I don't know why) and turn back, defeated. Jared, with head cloaked in mosquito netting, was still bouncing along like a kid, full of energy. Oh he had some bites on his hands (the only skin he was willing to offer to the beasts), but otherwise was unscathed. Not being fond of wearing head nets, I had opted to go "au naturel" above the collar. We decided to hoof it upslope to get above the boulders, then return to the car via higher ground where the walking would be less strenuous. All was well with that plan for, oh, I don't know, maybe a hundred yards. "There's a big hemlock down there... should we go down and check it out"? Of course! So back downhill a bit we went. 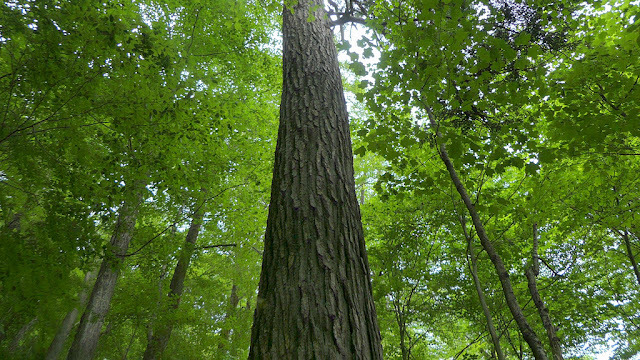 The big hemlock was 11.84 feet cbh (circumference at breast height, a standard height of 4.5 feet), and it showed signs of old age: advanced bark development, thicker uppermost limbs. But it wasn't the champ we sought, which I knew to be larger in circumference, per Bob Leverett's 2014 measurements. We continued across the mountainside, in short order coming upon a small stand of hemlocks, not particularly large in diameter. But they were genuinely old. With an unwillingness to linger in the clouds of skeeters and chompers that enveloped us within 2.7 seconds of stopping, we moved along. There was no point in trying to shoot any video; the dastardly bugs immediately rush to the front of the lens for some reason, and there's no keeping them away. A number of them had to perish before I learned that. old hemlocks awaited us. I recognized these; I had been here with Bob three years ago. These too were quite old, and I was to learn later from Bob that one of them had been cored some time ago by a scientist who counted 430 years in its rings. This was an encouraging find... maybe good fortune will smile on us, and the Champ will magically appear? And soon enough, it did appear! I felt a swift renewal of energy, flies be damned. There it was, right where Bob and I left it three years ago. Hasn't budged an inch, near as I can tell. Jared and I had missed it on our way in; it's stationed farther up the slope than I thought, and the dense forest foliage keeps it well hidden. While I wantonly sacrificed myself to lure the swarming devils away from him, Jared set about the task of measuring the tree (I'm not convinced he appreciated my honorable efforts). The circumference (or girth), by convention, is measured at a point 4.5 feet (breast height) above ground. If the tree is on sloped ground, then you must find the spot that's mid way between the up-slope and down-slope sides of the tree, and measure up from there. "Thirteen point two" he yelled out from within his head net. The next step was to determine the tree's height. For this, today's technology is a state-of-the-art laser rangefinder. Using "Spiffy", his Tru-Pulse 200x, Jared hastily pegged the height at 112.75 feet. My self-sacrifice wasn't working as planned, and the winged warriors were attacking him mercilessly. We need to remeasure this tree come fall, since Bob's previous measurement yielded 115.5 feet. It has a broken top, and may have lost more since Bob last saw it. Mission accomplished, we picked our way down the mountainside, often discovering new inter-boulder voids without warning. 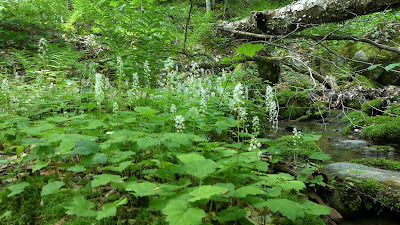 Once at the bottom, it was a cakewalk through swaths of streamside foamflowers in bloom. Black flies? What black flies?